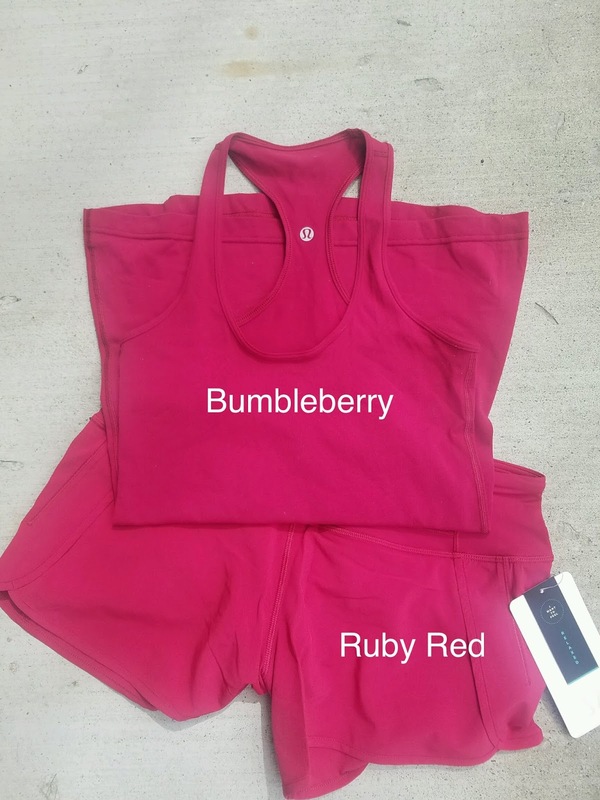 Big thank you to reader Ms. S for sending us a photo comparison of Ruby Red to Bumbleberry. She was responding to a request from other readers on last weeks upload post. Photo was taken in natural light. Wow they're almost identical! 🙂 I love bumble berry! Thanks Ms. S! You can barely see the difference but I think bumbleberry has a bit more blue/purple undertone to it. I'm so glad I ordered a ruby red CRB II. It's such a pretty color! I saw Cranberry and Ruby Red together in store, and they are almost identical as well. Cranberry is almost a slightly duller version of Ruby Red. But they were so close, my kids insisted they were the same color. Was waiting for the FTB Tranquil to come out in ruby red this week. Just checked the Australia upload and it looks like that color is coming out in the FTB Serene. Does anyone who has tried on both have any insight into sizing? I am a 6 in the FTB Tranquil, but an 8 in energy, FTBW and most other lulu bras. Wondering if I should go with a 6 or an 8 in the FTB Serene. Thanks in advance. Oh same issue here. I have same sizing issue as you. I was wondering about difference between the serene and tranquil bras…they look identical but the serenne looks to be pulled way down her back as i assume straps are quite long. Also the new fern print is amazing but price converts to 138 canadian for crops…yikez. Hoping for a cheaper alternative to that style crop.